Capt cautioned me against overconfidence. Then he asked me to reconsider my strategy of expanding New Order territory. 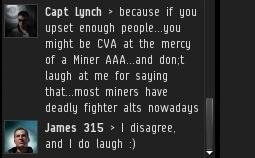 Next, Capt jumped over to a historical refresher course on how CVA alliance had been defeated by AAA, and how this was similar to how the miners might rise against me if I didn't treat them with respect. I felt the danger was remote, and I told him so. As he spoke with me, I noticed he repeatedly used semi-colons instead of apostrophes. It was odd, and something that seemed familiar to me, but I couldn't place it. ...Back to Sirseshin again. He reported a hotbed of resistance in that system. Truthfully, we haven't been able to spend much time there, since we made our temporary move to Tolle shortly after Sirseshin was annexed. 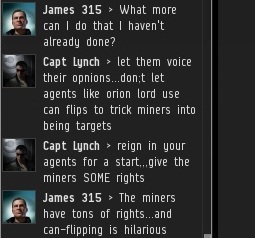 Capt's next idea was to give miners more rights, and to curb can-flipping on the part of my Agents. I had to turn down this request, as well. He ought to have known better: Just a few weeks earlier, I had a post in which I celebrated the very can-flipper Capt mentioned. 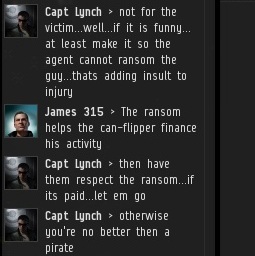 Capt was quick to chime in with his opinions on ransom policy. My policy is that pirates ought to keep the ransoms they collect. They should also feel free to execute the kill on the players who pay ransoms, because kills are so rare a thing in highsec. Capt finally had to leave, but not before making one last suggestion that I had to reject. It was a strange conversation. 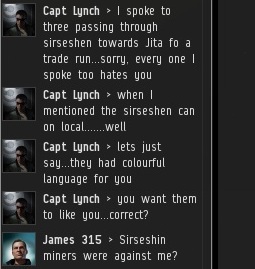 Not the first strange encounter I've had since becoming Saviour of Highsec, but still, something seemed... off. A few days later, our grand bumper fleet assembled in Halaima to hear my Big Announcement about the move to Tolle. As the troops gathered, Agent BillMurray asked about a commenter who had left an invitation for an ISD interview. Before they became EVE-O forum cops, ISD was known for writing stories about EVE news, which all players could see when they logged in. Agent Kainotomiu Ronuken revealed that he had contacted the commenter in-game, but that things had gone awry. Though he never said it outright, Capt's comment left many with the impression that he was a member of ISD, or somehow affiliated with them. He wasn't. 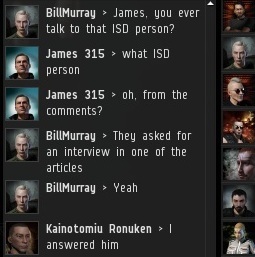 He told Kainotomiu that ISD policies didn't allow them to take his story, but Capt submitted his "notes" anyway, before the alleged incident with his brother occurred. Capt had brought up a dizzying array of topics during our conversation, but the ISD wasn't one of them. As I tried to work my way through this mystery, I remembered something Capt said earlier, about how he'd been following the trial of Ba'Ba, the black sheep of the New Order. The post announcing the shareholder vote for the trial had exploded with 56 comments. I went back to take another look. Then I saw them. The semi-colons. Posting anonymously, Capt Lynch raged against the New Order before any of this ISD stuff took place. As I peeled back the layers, this mystery became more and more bizarre. 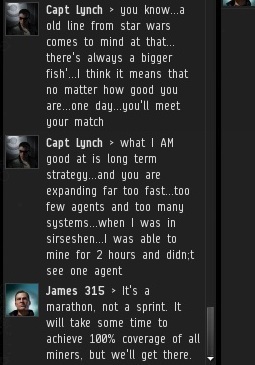 ...And then I began reading certain chat logs. Time to find out how deep this rabbit hole goes. You know James, I have a feeling December 4th is going to be a bad day for you and most of your 'agents' if the miners put their collective wallets together and head to the Bounty offices. How do you think the bounty changes are going to work, are you presuming that just because a pilot has a bounty on them that you can gank them with impunity? 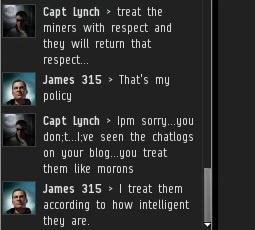 If the miners do club together and hunt us all down including our glorious leader then James 315 will have won. To hunt down and kill him you will have to talk to others, use more than one click on hour and on the whole interact with the community and game on a level that no bot aspirant ever has, therefore doing what James 315 has wanted you to do. Bing Bangboom: I have learned much from watching the Angel Violette battle. It has weaknesses. I believe I can take it. So does this mean T20 is a miner now? So I must have missed something. 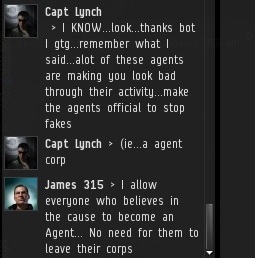 Where does that last chat log with Lynch and the ISDs come from? That will be explained in the next Part of the Capt Lynch saga. Think of it as an out-of-context promo. "Next time, on MinerBumping..."